Our Full Day has it all: great current, long pools offering amazing reflections, clear and clean swimming holes, plentiful beaches for picnicking and cooling off in the river, and a diverse abundance of birds and wildlife to satisfy nature lovers! Pack a picnic lunch, your favorite beverages, and slip on your river shoes. 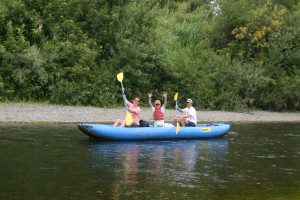 Then glide your comfortable and stable SOAR canoe into the current towards the most secluded and hard-to-access section of the Russian River . Our Full Day is self-guided and self-paced. Most times you will drift and paddle quietly in the serenity of this magical river. Occasionally you might be challenged to avoid some overhanging branches. 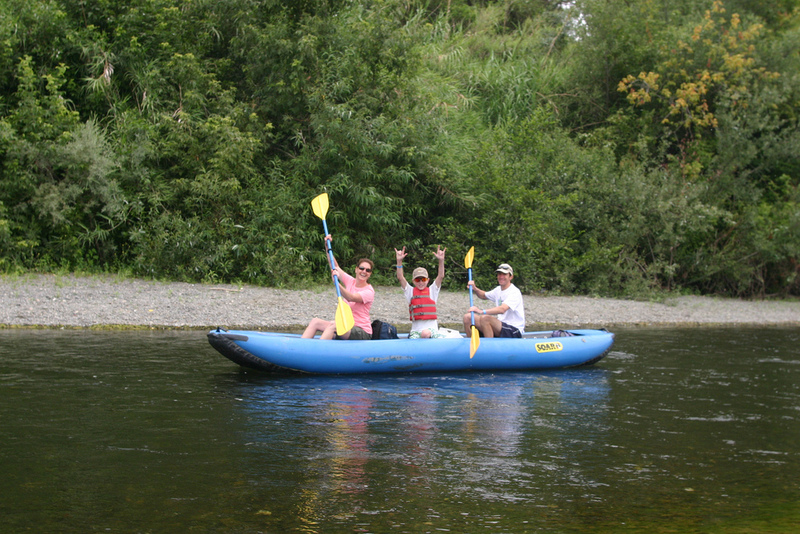 Our pre-trip orientation will help you paddle down the river safely. 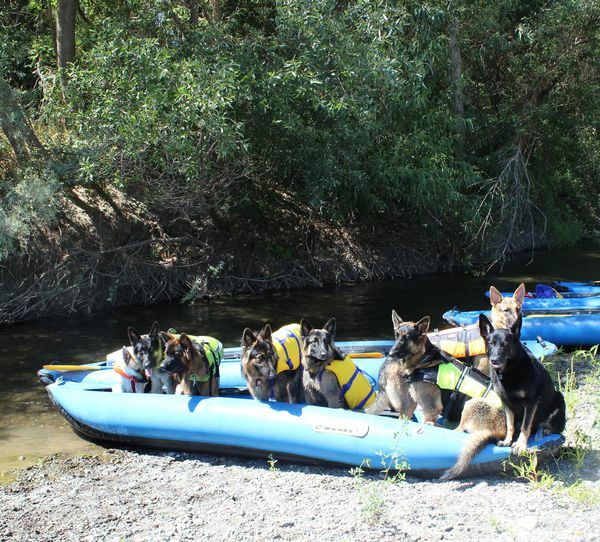 For dog lovers, our Full Day offers water-loving dogs one of the best activities anywhere! Our Healdsburg check-in window is open from 9:30 am to 10:30 am, and the first launch begins at 10 am. Actual paddle time is approximately 3 hours, and most people usually take a leisurely, fun 4 – 6 hours to complete the trip. 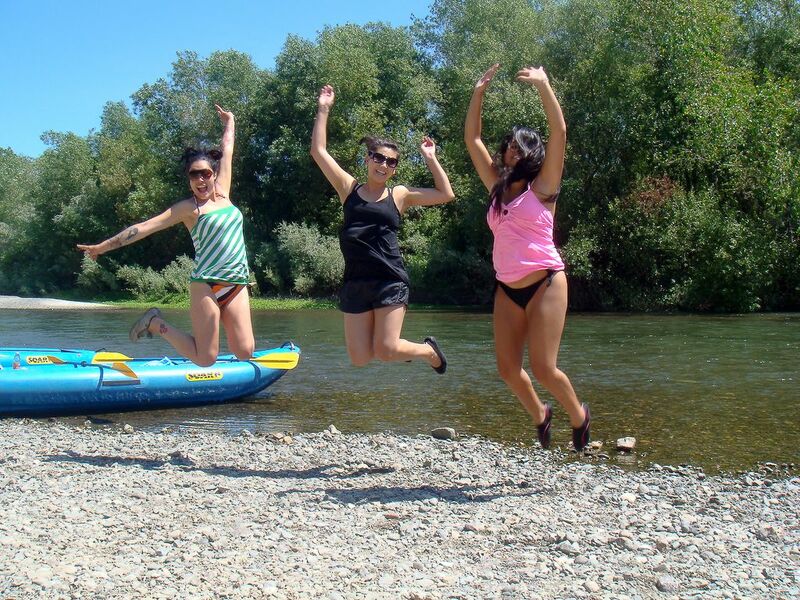 We launch from the base of Memorial Beach Dam, just steps from our office in Healdsburg. We ask our guests to arrive at our office sign-in between 9:30 – 10 am, so that the actual launch takes place before 10:30 am. The period of rental officially ends at 5:00 pm on the day of rental. We will offer a 30 minute grace period for late end-of-day arrivals. Any canoe that has not arrived at our Wohler Bridge Take-Out by 5:30 pm will be assessed a $50 per canoe late fee. The renter of record whose credit card we have on file will be charged, and is responsible for all late arrivals in that party. Any canoe that arrives after 7 pm will be charged an additional $100. This policy will be strictly enforced! Children – (ages 2 – 12) $30.00 Note: Children 12 and under must wear a life jacket at all times while in a SOAR canoe. Infants – $30.00 There must be 2 adults in this canoe. The infant must be directly in front of an adult that is a competent swimmer. The other person must be comfortable paddling a canoe / raft. If not, please leave your infant with a sitter. Dogs – $10 ea. Dogs must be kept on a leash at all times at our office and in our parking lot. Attention to your dog’s physical condition is necessary. Dogs get tired from all of the swimming and running. We sell & rent doggie life jackets at our store. Groups – Group of 10 or more adults qualifies for a group discount. The discount will automatically apply on the online reservation when the 10 Adult requirement is met. Full payment is due at the time of your reservation. For Monday – Friday reservations, full refunds are possible if cancellation is made before 5 pm the day before the reservation date. For weekend reservations, full refunds are possible if cancellation is made before 5 pm on Thursday before the coming weekend. After 5 pm on Thursday it is possible to reschedule your trip, but there is a 50% penalty. For groups of 8 or more cancellations must be made 5 days prior to your departure, cancellations made less than 5 days prior will be subject to a 10% per person cancellation fee. In case of rain or bad weather, there will be no refunds. We will issue a rain check for a later date of your choosing. No shows – If you book a reservation and you or someone in your group do not show up and do not cancel, there will be no refund.